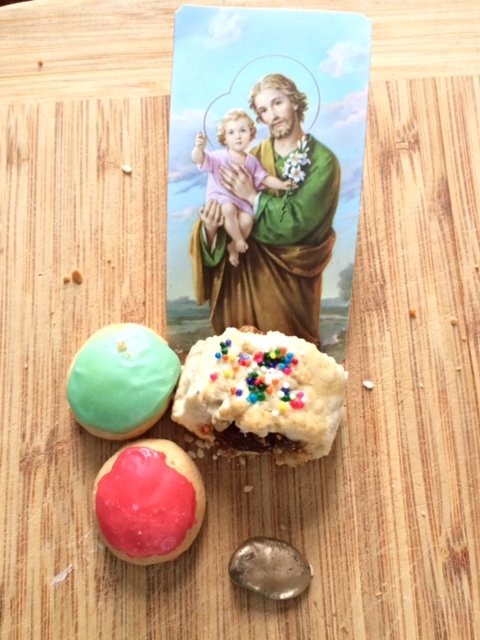 Yesterday (March 19th) was St Joseph’s Day, and here in the Big Easy it’s a big deal. 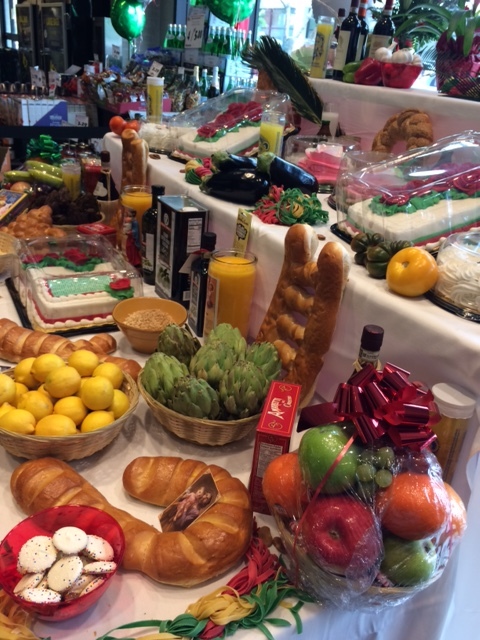 There are altars all over town, including churches, private homes, hotel lobbies, restaurants, bars and grocery stores. Yes, you read that right. A heavy influx of Sicilian immigrants to New Orleans brought the tradition of these altars here back in the late 1880s. St. Joseph was the guy who saved Sicily from a famine in the Middle Ages. He brought rain and a crop of lava beans. 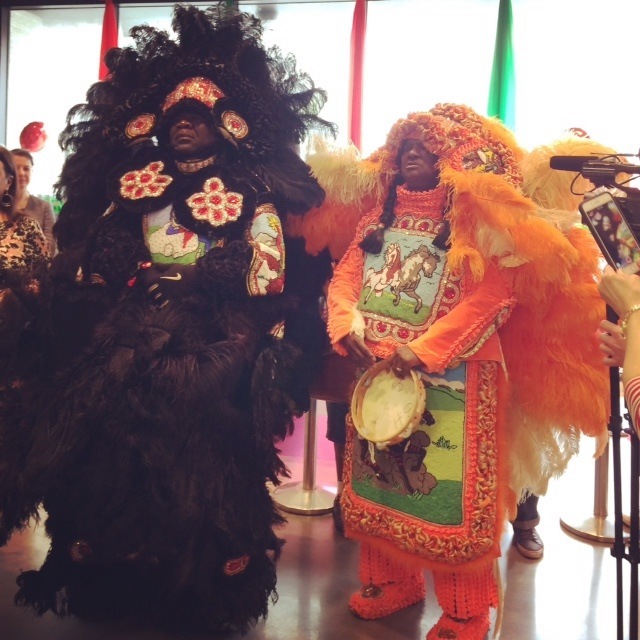 Unique to New Orleans, these are members of a tribe of Mardi Gras Indians. In addition to Mardi Gras Day, they parade and preen on or around St. Joseph’s Day as well. There is a rich history that surrounds the Mardi Gras Indian culture. They create elaborate beaded costumes for an annual tribute. This tribute pays homage to the native Americans that helped their enslaved ancestors during a rebellion. Details are fuzzy, but so far, this is what I understand. So, at the grocery store altar, they were joined by a priest, a rabbi, and a representative from an Italian food company. This is like fodder for the classic ” A priest, a rabbi and a (fill in the blank) walk into a bar…” You really can’t make this stuff up. 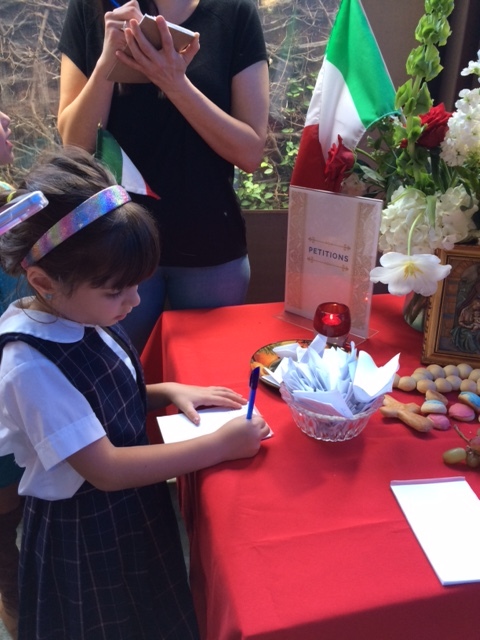 FYI: Both groups (Sicilians and African Americans) shared cultural traditions like St. Joseph’s Day and brass band music, and also racist violence. 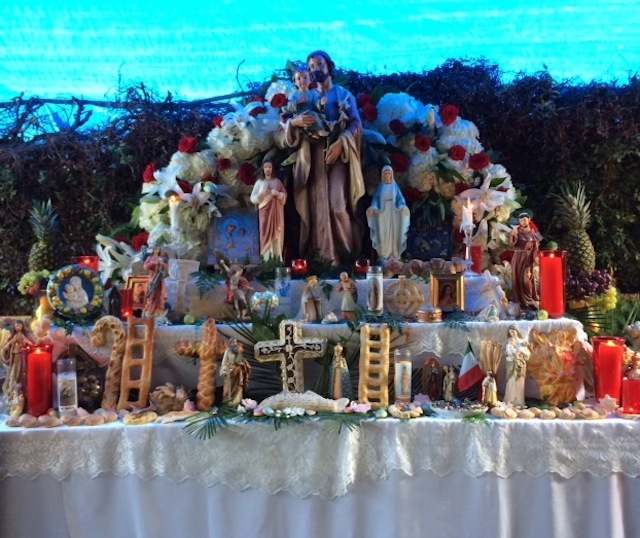 St. Joseph’s Altar at the local grocery store. Anyhoo, there was a celebration and a second line (a parade of sorts) and I bought groceries, but forgot to see about a lucky fava bean. So I took a ride to another altar. I made a donation, and got a little goodie bag. The fava bean is the thing at the bottom. Wish me luck! 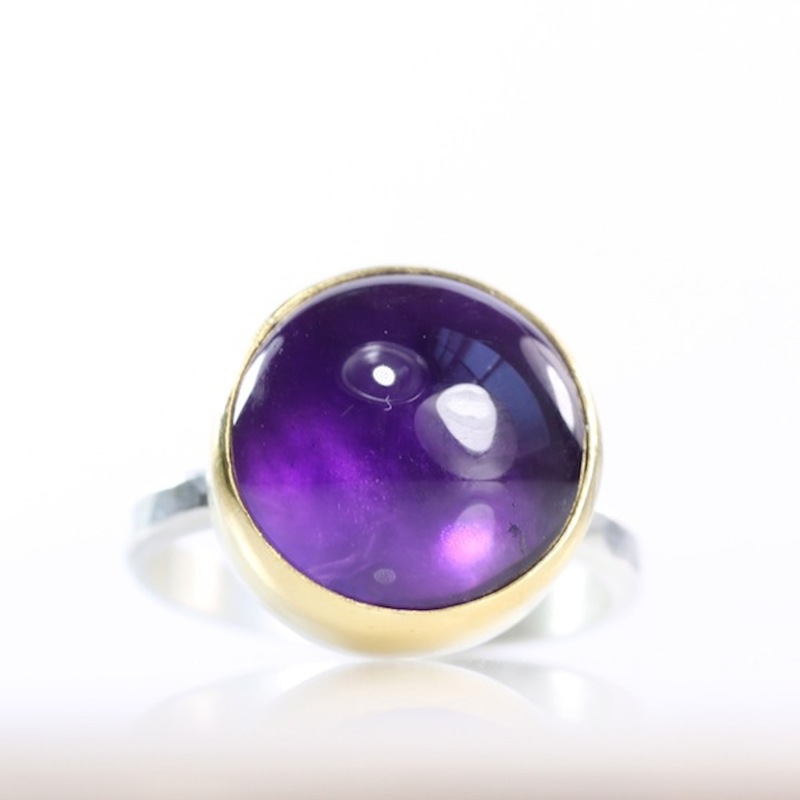 Oh, and since this is a jewelry blog, here’s some Leda Jewel Co jewelry with inspired colors like the jaunt around town. Available in the shop: ledajewelco.com or click on a photo for more specific info. Pantone named “Flame” as one of the top Spring 2017 colors, and I am happily (accidentally!) obliging. This year I found a handful of perfectly sized aragonite “sputnik” crystals. They were just too cool. Did you know that in addition to being grounding, stress relievers, these clusters encourage conservation and caring for the earth? 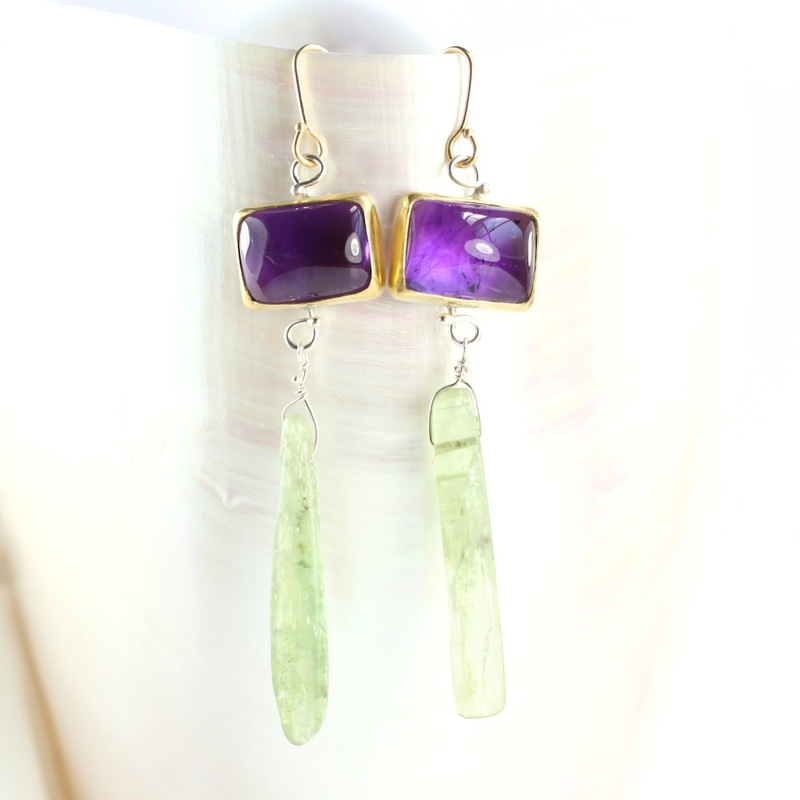 I paired them with some lovely rose cut emeralds. Since I was on an orange roll, here’s a pair of emeralds with sunstones for you more “demure” types. Not big enough for you? How about some honkin’ big morganite (aka as pink emerald or pink beryl) babies paired with orange kyanite and sapphire briolettes? No wallflowers need apply for these. Just saying. A couple of BIG rings: Cantera aka Mexican fire opal and a gemmy pink rhodochrosite. Both over 30 carats each. Here in the Big Easy it’s the height of Carnival season. I generally try to avoid crowds, but sometimes you get an offer you can’t refuse; this one was “above” the crowds, courtesy of some of my friends in high places. We were invited for dinner at a fancy schmancy restaurant that included a viewing stand. I had a perch to see three parades, including the Krewe of Muses, which is an all female crew. It’s all about shoes and bathtubs, my kind of theme! Let me use the watery theme to segue into March, which means aquamarines! One of my favorite rocks, from the berylicious (or in boring scientific terms “beryl”) family. I am always on the hunt for cool specimens, and this year in Tucson I found the coolest aquamarine crystal slices. A matching pair of beautiful cross sections showing different shades of blue in the natural crystal structure. They are now a special pair of earrings, reminiscent of ancient Roman jewels! I also bought a handful of polished, natural aquamarine crystals, perfect for rings and pendants. This one is especially nice, long and lean with a little curve action! Adding a little interest to these earrings is one of my other favorite rocks, chrysocolla. I have a nice little collection of this stuff, looks nice with aquamarine too. My latest pièce de résistance is an emerald cut berylicious with gorgeous inclusions. It’s big and honkin, over 40 carats! You can get lost inside this world for hours. Beryl with Inclusions – a closer look! Last but not least, not a berylicious piece, but still droolworthy in my humble opinion. Natural turquoise with black matrix from exotic Uzbekistan. Perfectly Miss Matched earrings. For those of you who live where Fat Tuesday is just another Tuesday, go ahead and overindulge in your favorite treats and pastimes! You can repent later. That’s what we do in New Orleans! To say that we are living in “unusual” times would be an understatement. Thankfully, I can tune out, and touch rocks to keep my sanity. Last week I gathered some of my favorite “ruff” stuff, and worked on this talisman. The combo of raw spessartite garnet (encrusted with pyrite) and the raw orange kyanite (this piece is encrusted with mica) just seemed to kumbaya together, in an earthy but elegant sort of way. They both help with creativity. Adding the grounding black spinel in a pave diamond setting made me feel better too. Pyrite brings self confidence to the mix. Mica has reflective qualities to see flaws without judgement. Ready to layer, with say a deep orange strand of mandarin garnet? If you’ve read this blog before, you’ll notice that I often refer to my collecting or um, “hoarding” of rocks. This really beautiful hessonite has been in my stash for awhile. I have loved it and gazed upon it for quite some time. It’s ready to go out in the world as a ring. It’s a very unusual cut called “surface cut”, a gorgeous peachy color, and a nice size; over eight carats. Perfect for artists of all kinds: hessonite garnets inspire and bring out the artist even in the seemingly untalented! Hessonite garnets also remove dark thoughts and intensify one’s life. My other obsession is opal (OK, I have way more than just ONE other obsession). But, I did free a couple from my stash to make these Miss Matched earrings. FYI: Opals offer inspiration and enhance creativity. Clicking on a photo will take you to the shop for more info on these pieces. Happy 2017 to all. It is garnet groove approved! Every now and then, I try to do the “right” thing! Get with the program and make a smart business move: like get timely with birthstones. So this month, I made a couple of things with tanzanite and turquoise (December’s birthstones) and then I just made whatever the heck. I just love inclusions. Dendritic agate = a whole little miniature world in and unto itself. 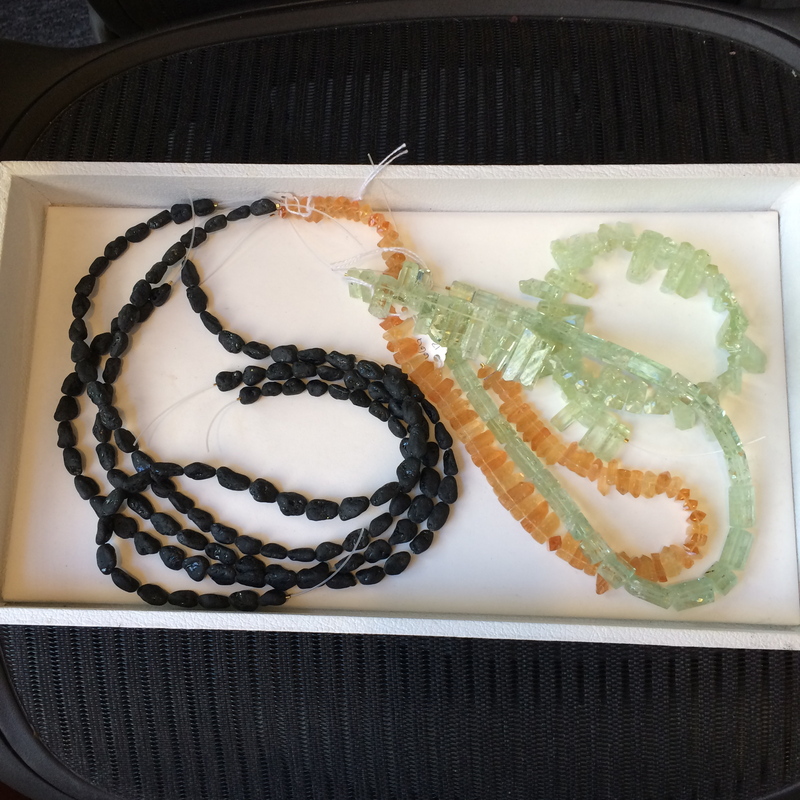 Speaking of inclusions, in my stash of goodies, I had a couple of very rare paraiba quartz pieces (aka Medusa quartz). This stone comes from a mine in Brazil, that has since closed. The inclusions are called “gilalite”, which is blah blah blah for the mineral that gives the gorgeous blue/green color inclusions. Then, since we’re still waiting for a frost down here in the Big Easy, I took a couple of icy Herkimer diamonds out, and paired them with some drop dead gorgeous aquamarines. Very cool (pun intended). 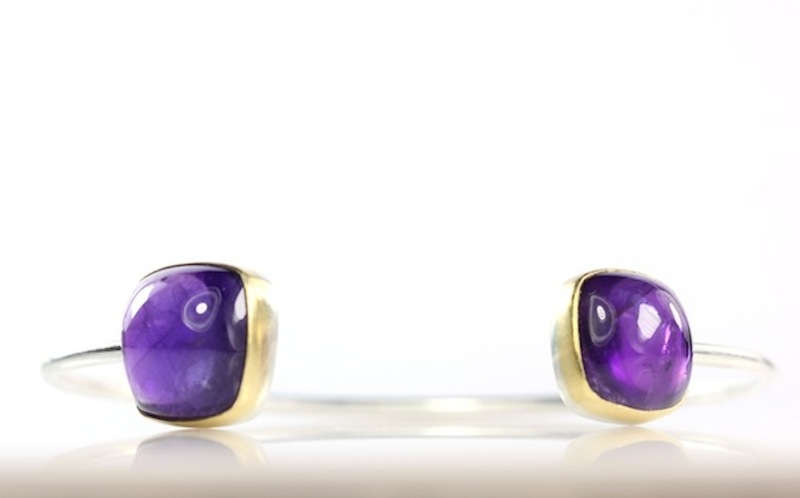 Want more birthstone pieces? Let me present an encore viewing of some rocks that a December baby or pretty much anyone else would love (clicking on any image takes you to the shop). For many people, holidays really are the “blue” season. This is the time of year that loneliness and depression affect people more than at any other time of year. Be kind, you never know who is suffering. Peace. 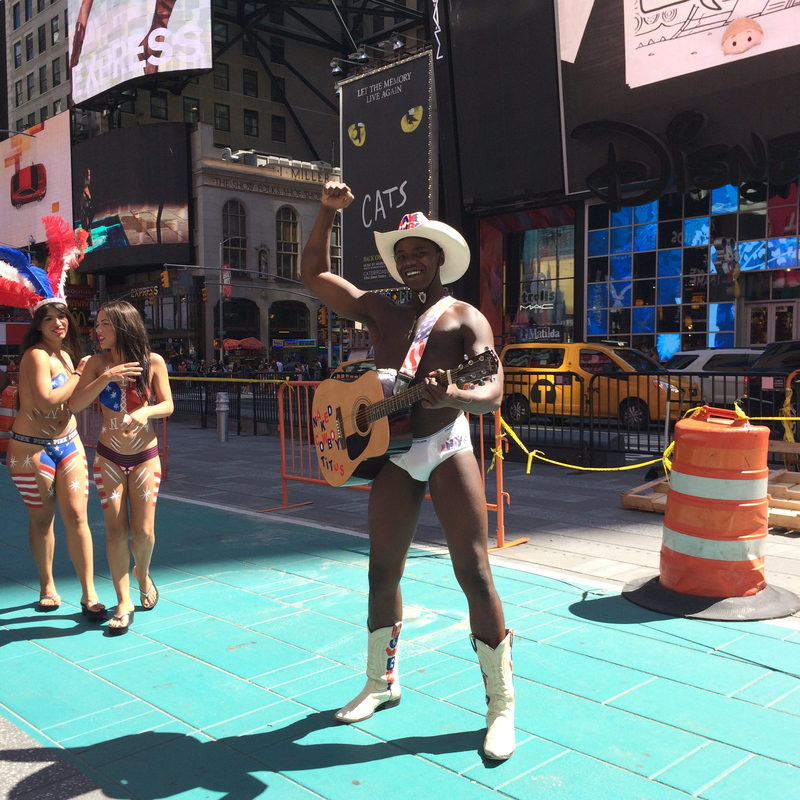 This summer after road tripping to Canada, I made a stop in NYC to get a rock fix. There’s a dealer that gets heart stopping stuff and, let me just say, I have a problem. I am a rock addict. I admit it, and apparently I do nothing (except give in). Here’s a tray with some of my stash. Note the green stuff (beryl) towards the right. A couple of sights on my way to do the deal. Then I went home, and got to work. Sometimes, the simple stuff is all you need. Click on a photo to take you to the shop for more info. Hope you had fun on YOUR summer vacation! 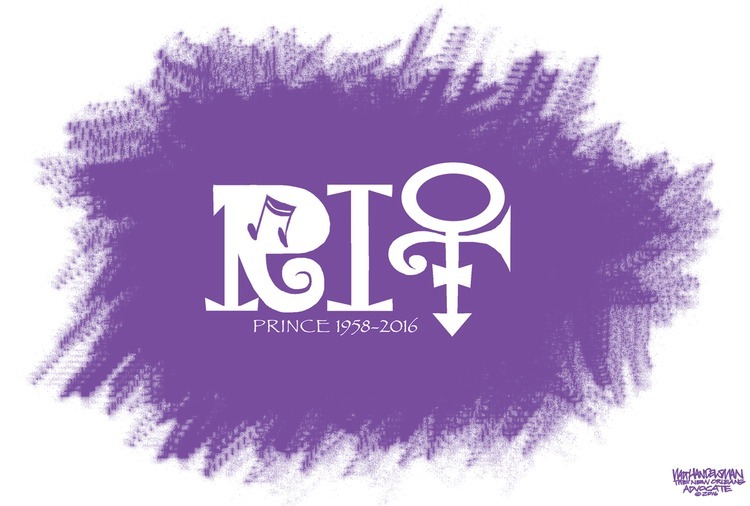 You could practically feel everyone’s hearts breaking last month, when the shocking news of Prince’s death hit the news. We have lost so many talents this year already: David Bowie, Glenn Frey, Merle Haggard, Keith Emerson. Good grief – it’s all too much. Whenever I don’t know how to handle a loss, I play with my rocks for therapy. This time they are purple. 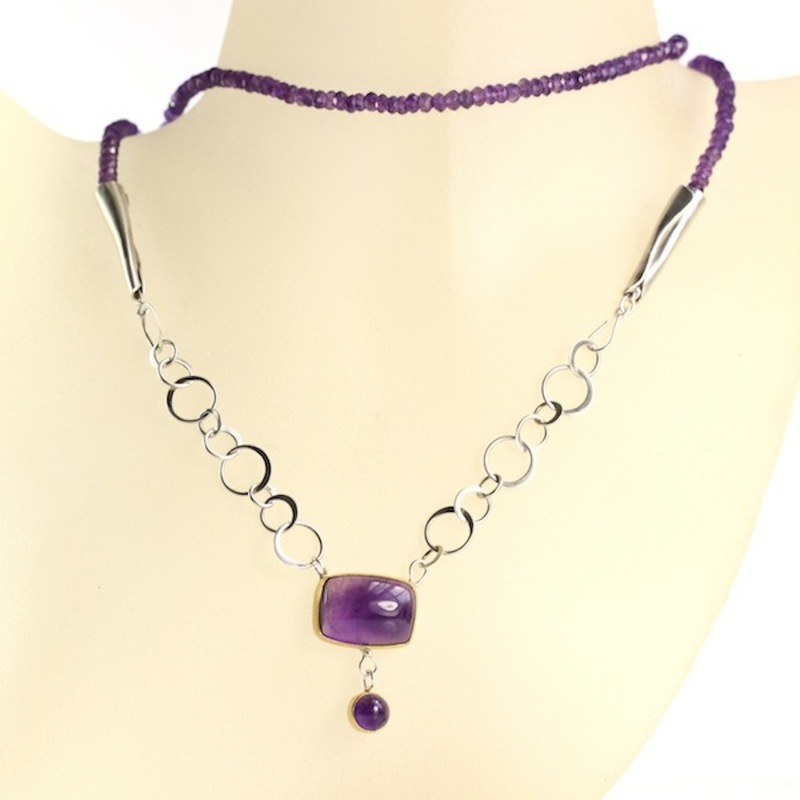 For the “Her Purpleness” jewelry collection, my tribute to His Purpleness. “There are those who do not realize that one day we all must die. But those who do realize this settle their quarrels”. Buddhist teaching. You are currently browsing the Earrings category at ledajewelco.